Once the anchor of reason has been cut, one's craft may go anywhere. One may become a St Francis or equally a Hitler. A powerful polemicist by all accounts he comported himself with courtesy and grace in philosophical controversies and exemplified the "rational temper" he advocated. 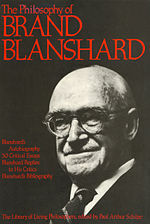 Percy Brand Blanshard (August 27 1892 – November 19 1987) was an American philosopher known primarily for his defense of reason.